I made TapSiLog to feature the Uncle Ben’s Whole Wheat Rice Giveaway but in our house, the real star is always the meat. This is simply called Tapa or Beef Tapa in the Philippines which kind of confuses some people who are more familiar with the term ‘tapa’ as it applies to Spanish tapas or appetizers. Tapa in the Philippines is more like a version of the beef jerky. My grandmother used to dry it too, just like a jerky. But nowadays, I know very few people who actually dry it. We now tend to simply marinate it then cook it straight away. When my grandmother used to make it, she would simply marinate it in salt and vinegar then dry it out in the sun until it dries out like jerky. When it comes time to cook it, they would just chop it up and fry it until it’s crisp tender. The favorite way to eat it was for breakfast with garlic friend rice and eggs; ergo the TapSiLog. This is my version of the tapa which I think captures the ‘essence’ of the real thing without having to dry it out in the sun. My version actually freezes well too so I do the same treatment that I do with the tocino and store them in serving size baggies in the freezer. This is also the reason why I tend to make a large batch at a time; but of course you can cut down the proportions if you’re making a smaller amount. For best flavor, marinade meat at least a day in the refrigerator before cooking. Some people like to fry the beef tapas to a crisp but I happen to like it a little more tender, more like a hot seared stir fry. So what I do is heat about two tablespoons of oil until it’s smoking then drop a handful of marinated meat. It will sizzle and spit a you so you may want to cover it until it stops popping. Stir fry it on high until all the liquids have cooked out and your meat takes on a wok seared brownness. 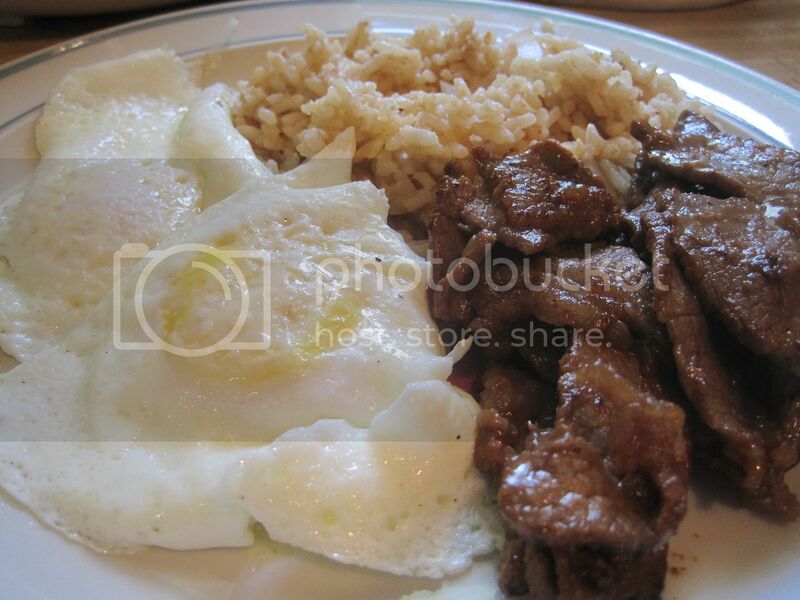 Remove from the heat and serve with rice and eggs for a genuine Filipino TapSiLog Breakfast. Of course, if you’d rather have it with vegetables instead of eggs, that would work too. That’s what I do when I need something quick for dinner. Enjoy! Yum yum yum. Mine always turn crispy so I’ll try your method next time. Thanks. yum yum! just dropping by to say hello! i agree on this one, tapa is a very simple recipe, those who are trying to complicate it are making something else.